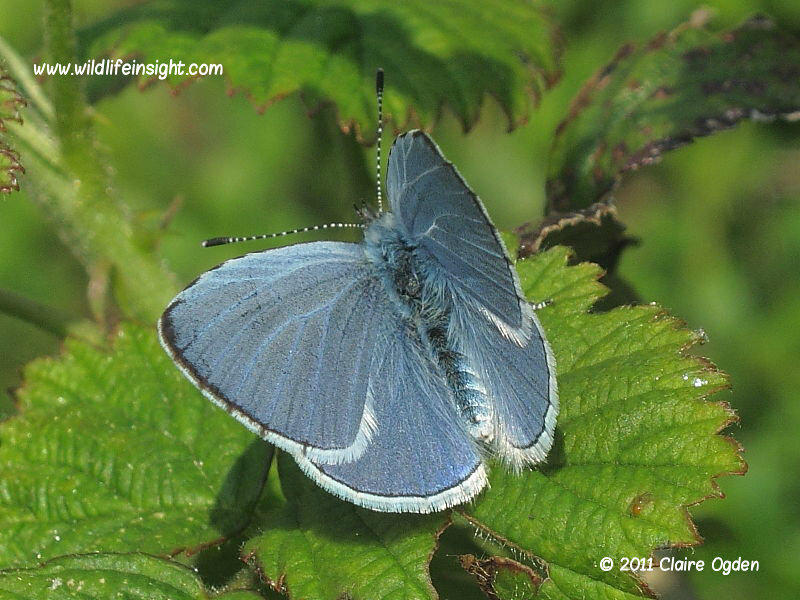 The Holly Blue butterfly is found throughout much of England and Wales, becoming scarcer further north and absent in Scotland. Its numbers fluctuate from year to year in response to the climate and the numbers of the parasitic wasp Listrodomus nycthemerus, which kill many caterpillars. 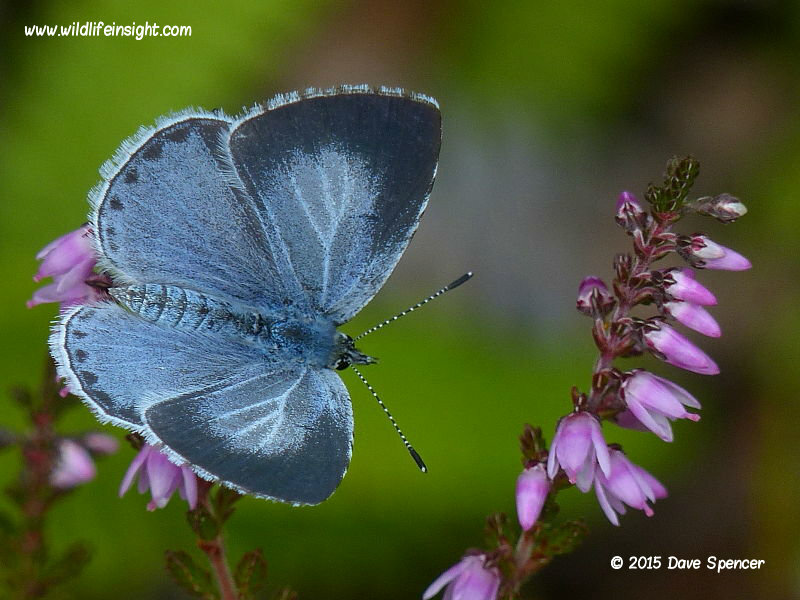 Although not seen in large numbers these little, blue butterflies are commonly reported from urban gardens, along hedgerows and on the edges of woodland. In the British Isles there are two generations with the first recorded from March to June and the second from June to October. The butterfly mostly rests with wings either closed or partly open revealing pale blue underwings with a few scattered black spots. 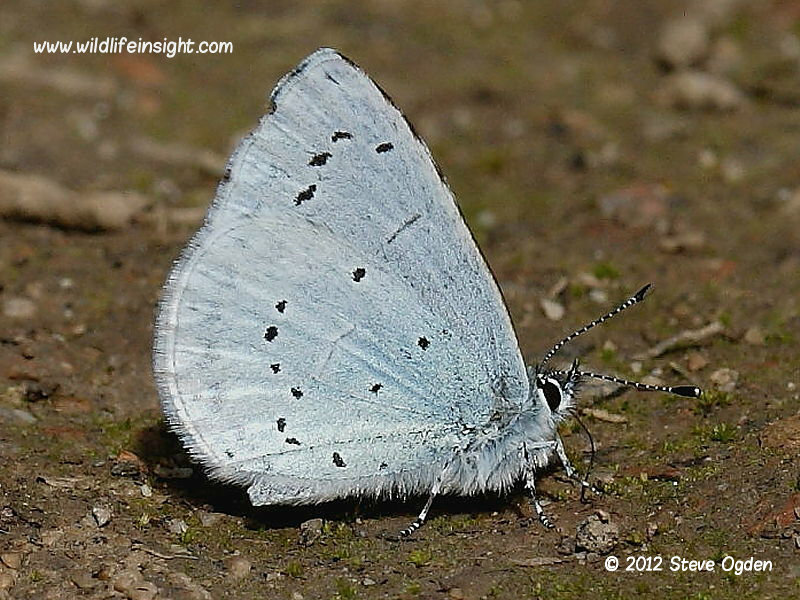 When seen with wings open the male has pale blue wings edged with a fine black border and pale outer edge. The female has a broad dark border to the forewing and broken dark wedges around the terminal edge of the hindwing. The butterflies are frequently seen sipping aphid honeydew from leaves, nectaring at holly and ivy blossom and settling on damp ground or paving. Here in Cornwall there are many inland and coastal sites where both generations of this delightful little butterfly can reliably be seen. Our personal favourites are coastal sites scattered around the south west coast path of south west Cornwall which not only offer the chance to see the Holly Blue butterfly but also offer spectacular sea views and a rich diversity of other wildlife including seawatching for sea birds, seals and dolphins! The best places are often where the coastal path passes between south facing blackthorn hedges containing holly and ivy. In these places the hedge on the seaward side offers some protection to the inner one without blocking out the sun and which the butterflies seem to favour. 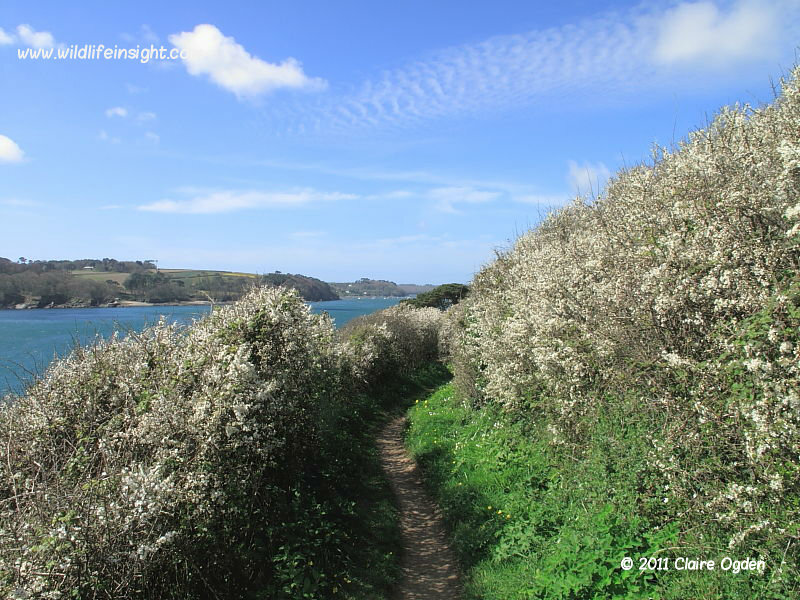 The featured image is of a typical Cornish coastal hedgerow in Spring. In Cornwall we’ve found it can be difficult locating the eggs and caterpillars of the first generation on holly, finding it instead more productive to wait until July when the second generation butterflies are laying on ivy. The eggs can then be often be found at a convenient eye height in the hedgerows. In late July only the ivy buds in the sunniest parts of the hedgerows are beginning to swell and the females appear to select these to lay on first. 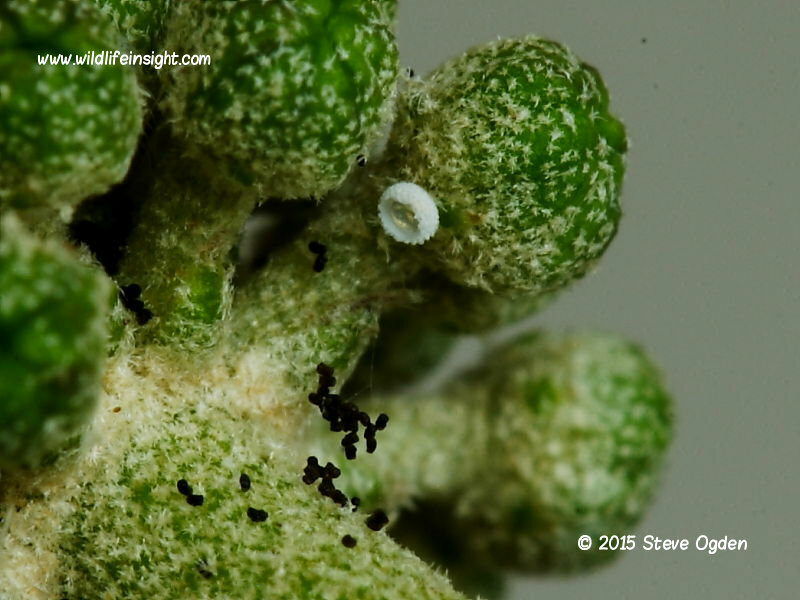 The tiny eggs , 0.6mm wide, are laid singly and difficult to see, often being tucked up tightly under a bud and out of sight. Closely watching a female pause briefly to lay eggs is often the easiest way of locating them. 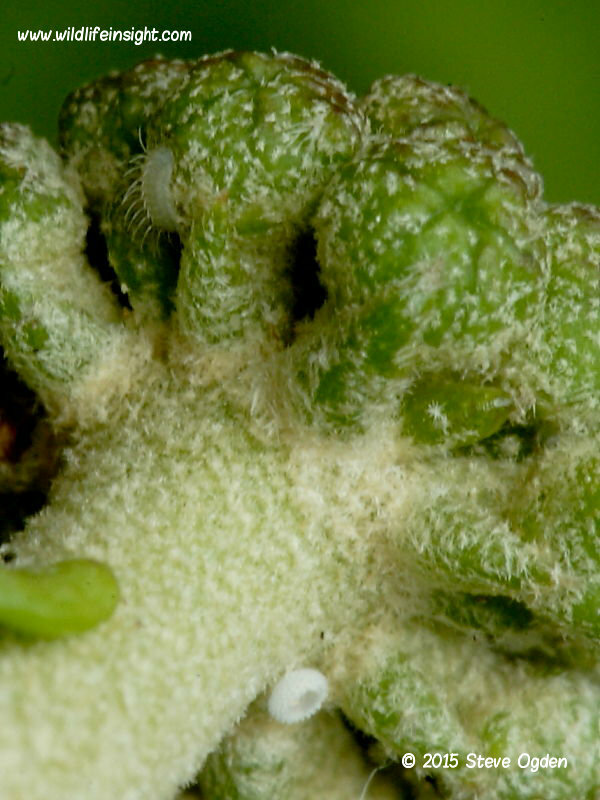 The caterpillars hatch within 7 days and immediately move up to the nearest bud where they are very difficult to spot. 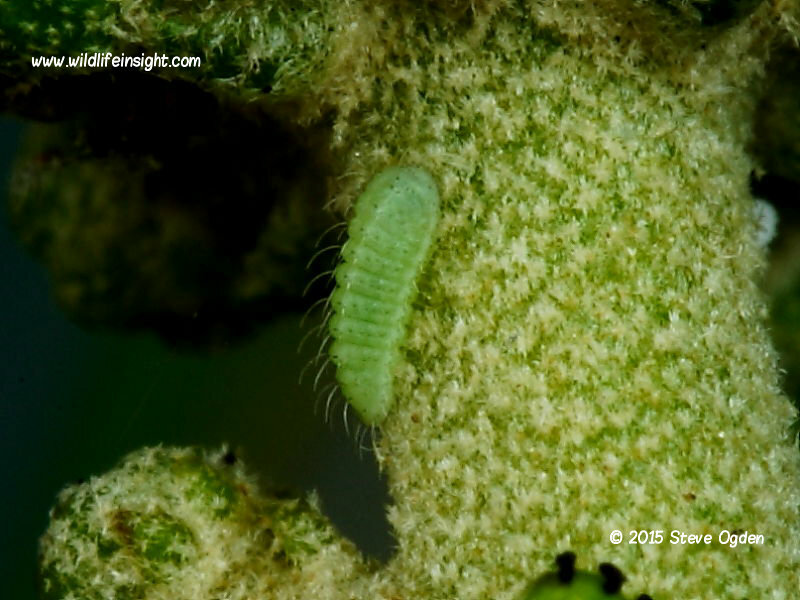 The day old caterpillars are barely 1mm long, pale with quite long, light coloured hairs and a black head. 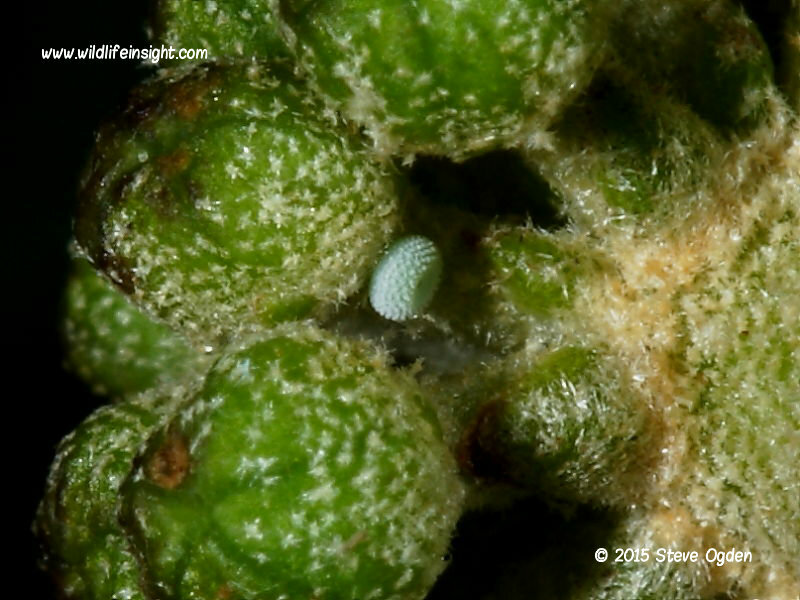 If an empty egg is found close scrutiny of the bud directly above often reveals the caterpillar – but even then spotting them isn’t easy. 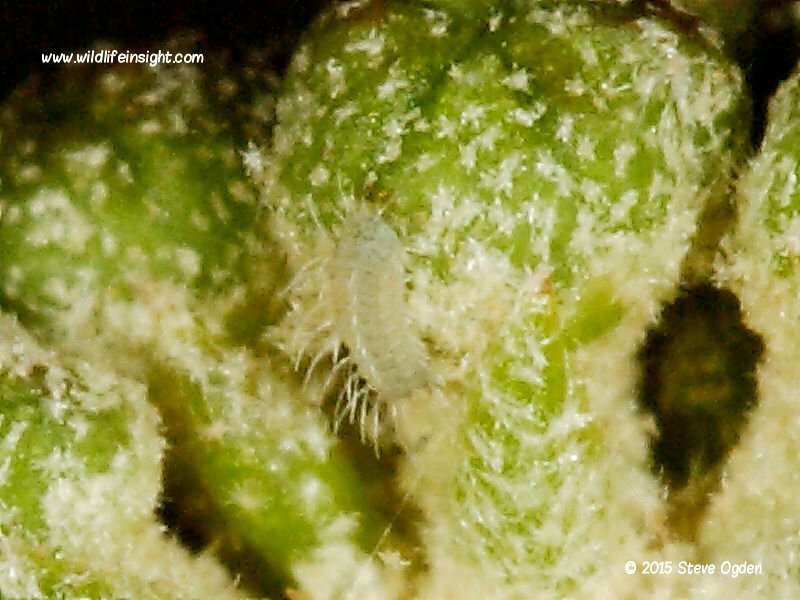 Within 4 days they are 2mm long and light green following their fist moult. Prior to moulting they will crawl to the underside of a lower leaf where they will change their skin. As they grow they feed unnoticed amongst the buds until when fully grown they may be found feeding exposed on top of the developing flower heads. 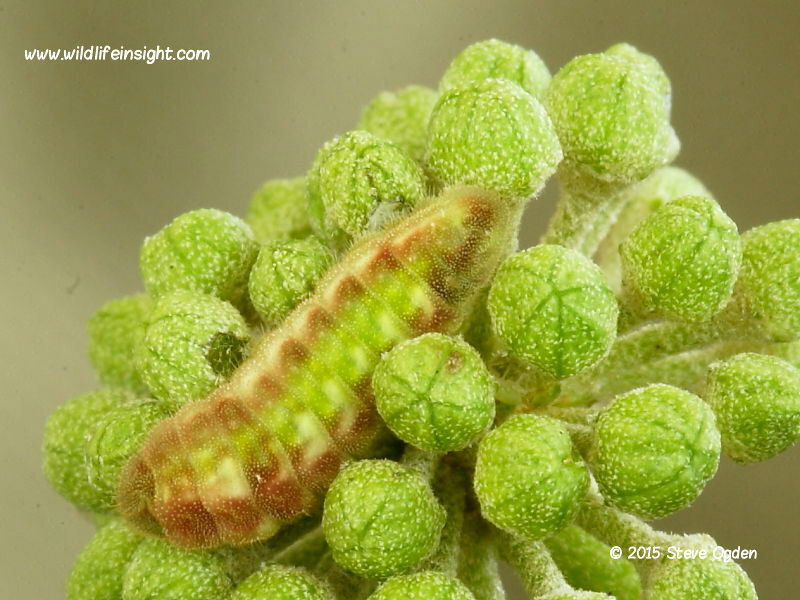 Finding distinctive holes in ivy buds where caterpillars have been feeding and black frass often helps locate a caterpillar. 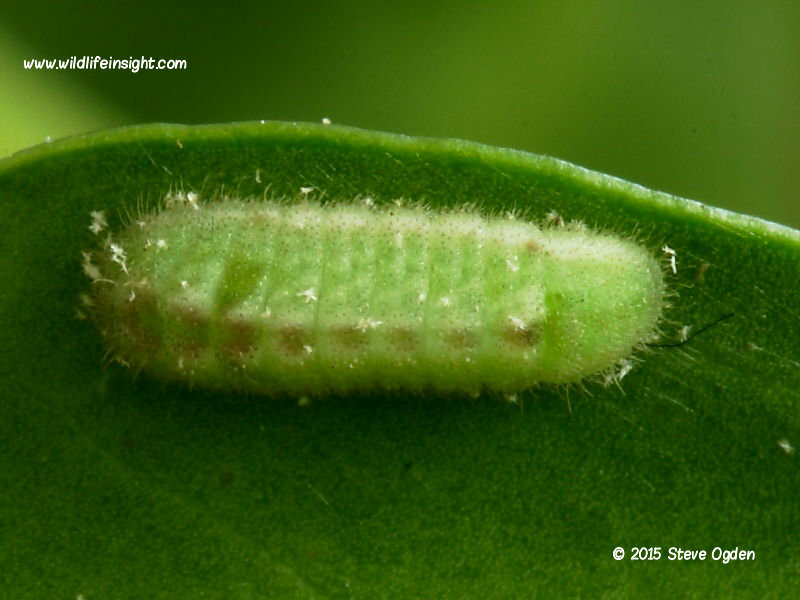 The fully grown caterpillars are about 12 mm long and generally have a light green background marked with variable amounts of white and pinkish/brown markings. 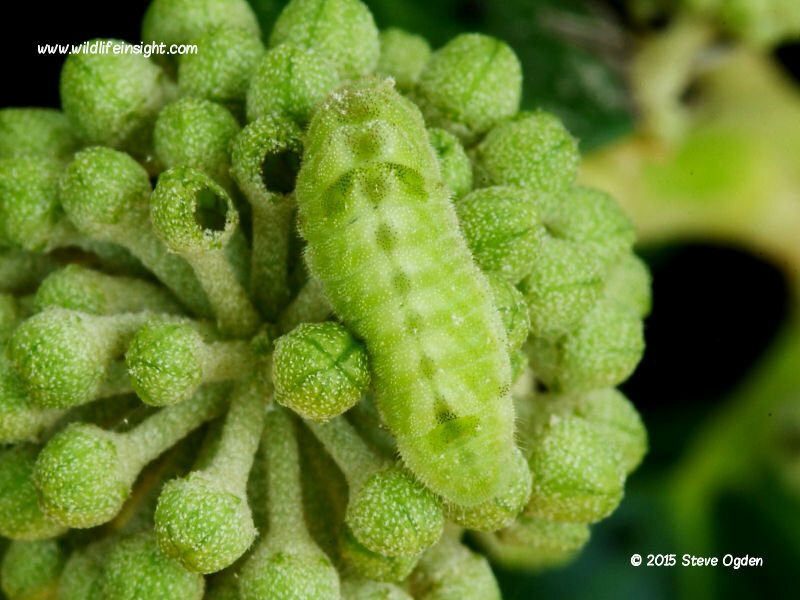 After 21-18 days the fully grown caterpillars leave the buds and search lower down for a place to pupate on the underside of leaves or ivy stems. 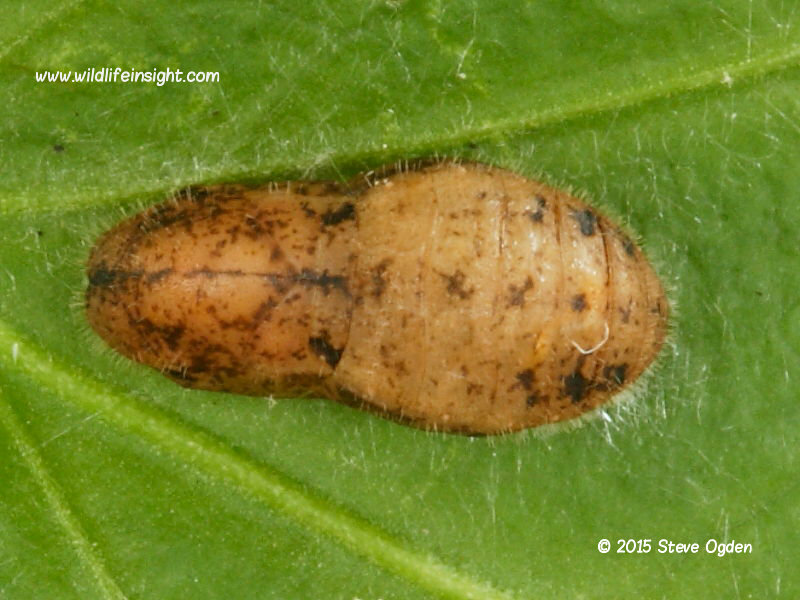 The light brown chrysalis are about 9mm in length and secured either upright or horizontally to the leaf/stem by a silken girdle. The chrysalis of the second generation will overwinter before the butterfly emerges in March/April the following year. The butterflies from chrysalis of the first generation will generally emerge within 10- 20 days depending on the temperature between March and June. 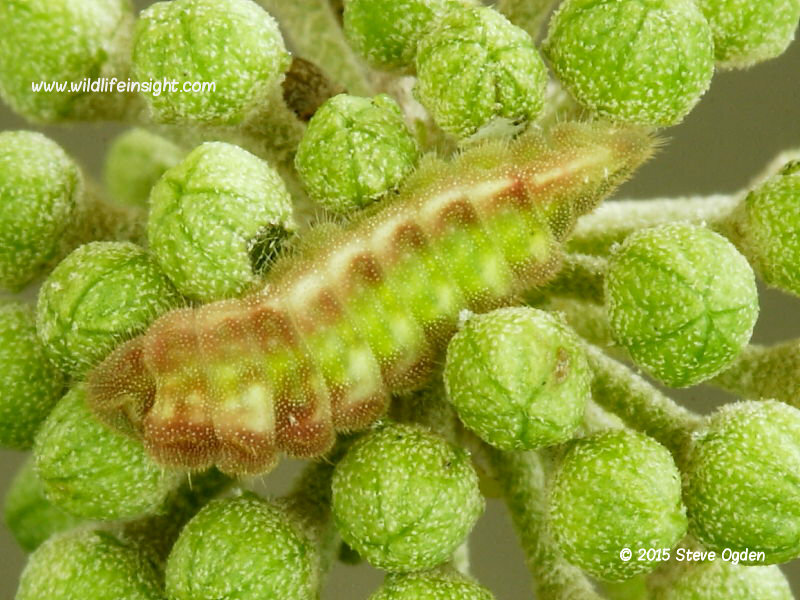 Many caterpillars are attacked by the parasite wasp Listrodomus nycthemerus which only feed on Holly Blue larvae. The Holly Blue caterpillars shown above were reared from eggs found laid on ivy in a Cornish hedgerow in early July.